IN his continuing search for the more weird, whacky and wondrous in the world of travel, David Ellis says that 90-something holidaymakers booked on the boutique 5-star British cruise ship Hebridean Princess in July have been told to take their holiday somewhere else – because the Queen wants the ship for a getaway with the Royal Family. 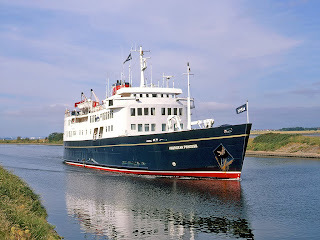 Hebridean Princess that boasts "outstanding service, fine cuisine, unusually spacious cabins for just 49-guests, and some of the most elegant public rooms afloat," will take the Queen and her family out of Scrabster on Scotland's far north coast for a week's cruise through the country's northern islands, followed by a week down the Scottish west coast. They'll visit such delightfully-named places as Muckle Flugga, Unst, the Vat of Kirbister, Cape Wrath, Tanera Mor, Rum and the Isle of Muck – with escorted shore excursions for those who want, although we think they'll most-likely pass-up on one to the Castle of Mey: it was the home of the late Queen Mum. The Queen is reportedly paying around $600,000 for her little family jaunt, and operators of the Hebridean Princess say those other guests whose holidays were cancelled to make way for the royals, "are being generously compensated and offered other dates."